One of my projects while I was in school studying landscape architecture was to design a tiny home, a 1000 cubic foot home. That is a 10’x10′ room with 10′ ceilings, which is a small bedroom. 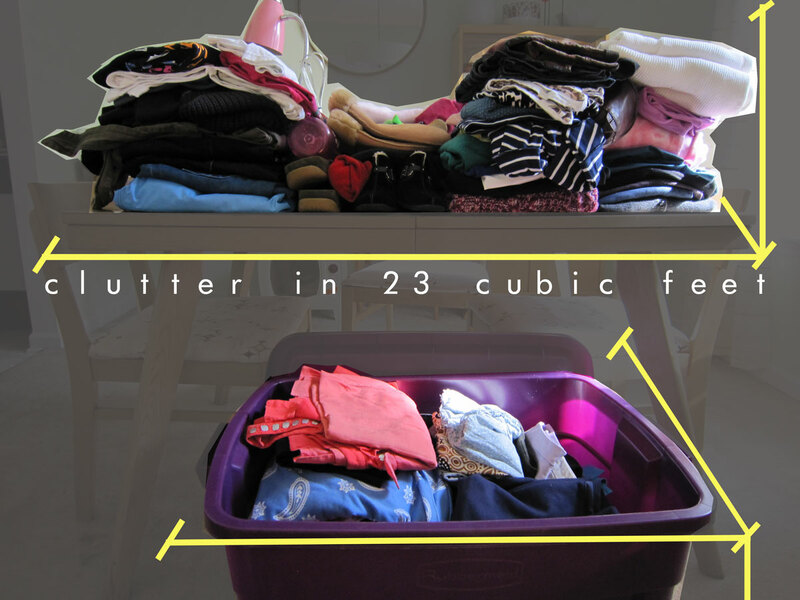 1000 cubic feet got me thinking about the home as a chunk of volume and how to utilize every piece of space. A few days ago, the blog Be More With Less gave a get-rid-of-100-things-challenge to do by mid-December. I decided to tackle my walk in clothes closet, where cubic feet really matters. Have you thought about your space in this way? I needed to seriously think over my clothes. I keep everything in one closet including bags, shoes, and accessories. The only things not in there are my pajamas and winter coats. It was getting to where I was running out of hangers and I wouldn’t put clothes up right away because it was stuffed. Has anyone else had this same issue? I like to keep everything in one place if I can. I took everything hanging out of my closet. I evaluated it on if I loved it or not, how well it fit me, if it was still in style and if I had anything else similar. I put the items I love back in the closet, others in the get-rid-of pile, or to try on. I took about 100 items to a consignment shop or donated. My closet is more manageable now, but I hope to thin it out more. Even though it’s still full….I’m able to put things up easier. I figure if I buy any clothes, I am going to get rid of something in exchange. I also have the same issue in my kitchen. Even though it’s better than it was, sometimes I don’t like putting up dishes because it’s just not easy enough. I found about 50 more items, from the kitchen and from around the house. I stacked my items on my dining room table and measured its volume. I calculated it was 23 cubic feet. If I were living in the 1000 cubic foot home I designed, that would be 2.3% of its space by these 150 items. If I kept my clothes in space bags (remember those?! ), maybe it would only take up 1%! In my 12,0000 cubic foot home it takes 0.2% of its volume. I’ll take all the breathing air I can get. Will I be getting rid of more things by mid-December? probably. Will I add more things by mid-December? probably, but not as much as I get rid of. I guess living more of a minimalist lifestyle doesn’t happen overnight.